Mikael Strandberg, Fellow of the Royal Geographical Society, and Johan Ivarsson are making a journey of more than 2,000 miles through one of the most inhospitable regions on earth - Siberia! This photograph of a Yakut tribesman was taken in circa 1900. Click on it to enlarge. Say the word "Siberia" to the average person, and what does he think? Frozen landscape people with exiled prisoners in Russian gulags. What 99% of the world doesn't know is that for centuries Siberia was the home of a unique equestrian culture - one that two brave Long Riders are preparing to try and rediscover. Swedish Long Rider Mikael Strandberg is already famous in equestrian travel circles for his long equestrian journey across Patagonia. He followed that up by living with the Masai tribesmen in Kenya for a year. Now the adventurous explorer is preparing for an incredible journey across Siberia, one aspect of which will be to locate the forgotten Yakut mounted tribesmen. On the left, Mikael can be seen with his horses in Patagonia, and on the right is a fantastic photograph of some Masai tribesmen who accompanied them in Kenya. Click on either image to enlarge it. Because of the hazards of travel in frozen Siberia, Mikael will be forced to use a variety of different means of transport to cross this vast countryside. He does not yet know if he will be able to find native horses and mounted tribesmen. He understands, however, that two of the most famous equestrian journeys of all time used the forgotten Yakut pony. 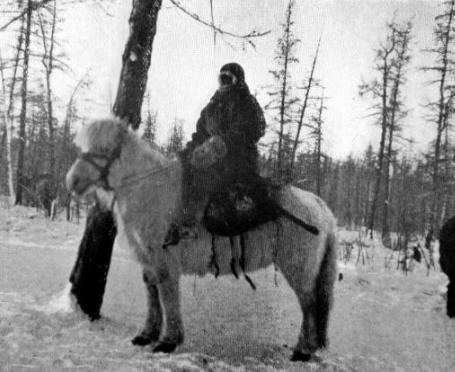 It is widely believed that the age of modern equestrian travel began when the famous Cossack officer, Dmitri Peshkov, rode his native pony Seriy across Siberia in 1890 during the depths of winter. An even more amazing but forgotten tale involved famed Antarctic explorer, Robert Scott. Instead of using dog-sleds to reach the South Pole in 1910, the British officer chose Yakut ponies for his doomed expedition across Antarctica. Unfortunately the ponies all died, some while pulling sledges for Scott, and others were trapped on an ice-floe and eaten by killer whales. Since the fall of the Iron Curtain, no one in the equestrian travel world at large has had word of the famous Yakut ponies and their fur-clad tribal riders. Long Rider Mikael Strandberg will be the first equestrian explorers in modern history to report on the existence, or demise, of this once-legendary equestrian culture. The Long Riders' Guild is proud to support Mikael, and his fellow explorer Johan Ivarsson, in this remarkable and dangerous expedition to the frozen corners of the world. Below is a message from Mikael in which he explain his plans and philosophy. "Minus 98.7 degrees Celsius is the lowest temperature that has ever been recorded on Earth. The thermometer that did so was positioned just beyond the estuary of the River Kolyma in north-east Siberia. There, the permafrost is one and a half kilometres deep and the remains of mammoths over 10,000 years old have been found, almost perfectly intact. For much of the year, daylight is nothing more than a faint glow on the horizon in the middle of the day. At 94 kilometres per hour, howling winds of unimaginable ferocity sweep over these empty spaces where polar bears weighing up to one ton wander among the ice fields, sustaining themselves on seals, fish and the occasional reindeer. The only people who manage to survive here are the Chukchi, hunters who also tend reindeer. They are perfectly adapted to survive under these extreme conditions. For most people, Siberia is synonymous with cold, deportation, prison camps and limitless expanses. Most of Siberia consists of flat tundra and far-flung expanses of wooded taiga, mountainous and undulating in places, with deep ravines. Here it is still possible to encounter small groups of people who have never heard of Stalin, the Second World War or Perestroika. The average winter temperature is minus 35 degrees Celsius, but it often dips to minus 60 degrees. At such times mercury freezes solid and brandy becomes the consistency of syrup. It is so cold that trees explode, blue sparks fly from falling timber and when somebody exhales, their breath is transformed into a shower of ice crystals, followed by a tinkling sound referred to as “the whispers of the stars”. This icy whisper was experienced by almost three million prisoners deported to the most feared of Stalin’s work camps: the Kolyma Gulag, the Auschwitz of the Soviet Union. Only a few per cent of those sent there between 1937 and 1953 survived. The others starved, froze or were worked or beaten to death in the dreaded gold mine. We plan to traverse Siberia from the north to the south over the course of a year, beginning in the late spring of 2004 – a distance of 3,500 kilometres. Parts of our journey will take us through areas that are little known, where there are neither roads nor people: a landscape dominated by the taiga, the largest contiguous forest area in the world, where freezing polar temperatures and permafrost reign supreme. The River Kolyma meanders for 2,500 kilometres to the East Siberian Sea in the north and we intend to follow it as much as possible. Although many difficulties will beset us, the severe cold will be greatest danger. This will be one of the coldest and most dangerous journeys ever undertaken in modern times." 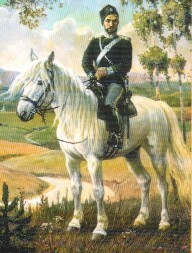 Long Rider Dmitri Peshkov used a native pony for his astonishing journey from Albanzinski, on the Amur River in Siberia, to St. Petersburg in 1890. For 5,500 miles he and his pacer, a gray named Seriy, pounded across the frozen steppes. They averaged more than 28 miles a day! "The main aim of Expedition Siberia is to use words, pictures and film to make a record of this unknown part of our world. This is a vital task, since in the course of our extensive research work we have realised that not even the Russians or the Siberians themselves have a comprehensive picture of the area along the Kolyma River. The obstacles are the cold, the distance, the size and the isolation. The area is untouched, remote and unknown. We shall also record the adventures and personal hardships we endure. There is an ever-growing need for dreams, excitement and adventure. It is almost a prerequisite for feeling good nowadays. We shall therefore record how we endure the cold, how we deal with the polar bears we meet, how our dog Sigge copes with brown bears and wolves, what we do about our various mishaps, how we cross pack ice and open water and how we survive by hunting and fishing. That in itself will be a great adventure. The same can no doubt be said of our relationship. Will it survive such extreme conditions or not? That is the question we are most often asked at our lectures, which indicates how important it is. This record of our journey will therefore be made in the personal manner for which we are so famous and that has been so successful. For that reason our personalities will be very noticeable, as will our sense of humour. During the course of our journey we shall meet at least four groups of native peoples: the Chukchis, the Evenks, The Yakuts and the Yagahirs. They are closely related to the Eskimos Lapps, Tibetans and American Indians as far as their culture, way of life, animistic religion and language are concerned. Nonetheless there are great differences, which very much depend on how well or how badly they have managed to withstand Russian colonisation, the dramatic changes in Soviet society and the current industrialisation of Siberia. Most of them have done military service or attended Soviet schools, can speak Russian and have adopted the mores of Russian society to some extent. But far from all of them, however – particularly those who still live along the isolated, freezing and inaccessible River Kolyma. The Chukchis are the most isolated and least influenced minority in Siberia. They are semi-nomadic, live in tents of reindeer skin and survive by hunting and by fishing from kayaks. In addition they manage their tame reindeer in an ancient fashion and do not even use dogs to herd them. They carry out their tasks bare-headed and without gloves whatever the temperature. They were the last of the Siberian native peoples to bow to the sovereignty of the encroaching Russians as they colonised this vast area in the sixteenth century. Of the four peoples, the Evenks most closely resemble the Lapps of Scandinavia. They ride, milk and tend their tame reindeer in the same way as the Lapps. They live by hunting and fishing. The Yakuts are semi-nomadic hunters and reindeer herdsmen and are those who have adopted Russian culture and the habits of Soviet society to the greatest extent. Originally they come from the Turkic-speaking parts of Asia and have founded the state of Yakutia-Sakha, which has yet to achieve full independence. The Yagahirs are a people on the verge of extinction: only 500 Yagahirs remain. They also survive by hunting and fishing. We feel it is important that during the course of our journey we should record how the original inhabitants of Siberia live, think and view the world around them and the future. Why do many of them still prefer their traditional way of life? Why have those who have adopted modern ways chosen to do so? How do they survive the extreme cold? There is much knowledge to be gleaned from them. Along the Kolyma there are also people who do not fit in to conventional society: recluses, fugitives, researchers, pioneers, former prison camp inmates, criminals, murderers and refugees. We want to describe these originals and misfits, their view of life and their circumstances. We also want to ascertain how the area has been affected by the enormous changes in society that have been the result of the collapse of the Soviet Union. This is generally considered to be a transition from a dictatorial rule that was exercised over the populace from the cradle to the grave, to the current Russian chaos of every man for himself. But perhaps the question should be: Have the people along the Kolyma been affected by ninety years of Soviet rule in any way whatsoever? We expect that there will be great international interest in our journey. We know that we have a large and faithful audience of all ages. Expedition Siberia will be a unique and idiosyncratic journey through a world that for a long time has merely terrified and agitated most people in the West. The time has come for the truth to be told!" The Guild has just received an email from Mikael, who is enduring unbelievably (but not unexpectedly!) cold temperatures there in Siberia. "I've come into an area where there's at least 4,000 pure-bred Yakut horses, some of them living in the wild. The Yakut people themselves, even ride them, no problem, when it is minus 65°F. They are short, stocky, hairy, relaxed and tough horses, that's for sure. They're made for Long Rides. Sturdy, the cold causes them no problems, they find food for themselves - they look great!" 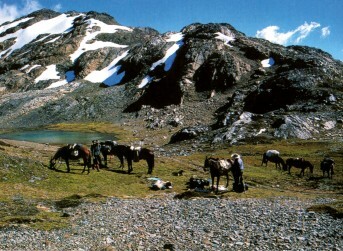 "The holy animal for the Yakut people is the horse. They ride it and revere it. I will come back one day to do a trip, a winter one, with a bunch of these horses, that's for sure! So I will set up a network of contacts to be used by Long Riders like me. The Yakuts are good people. I get along very well with them. People are truly great here. Some of the finest I've come across." Mikael knows what he's talking about - he's travelled just about everywhere on the planet! Ambarchik Bay, Siberia, Monday, April 25, 2005 – Mikael Strandberg, the Swedish extreme explorer who spent part of his youth in Essex, announced today that he and fellow Swede Johan Ivarsson have succeeded in finishing their nine month long expedition through the desolate and freezing north eastern region of Siberia. They started their gruelling expedition in the south on the Kolyma River and have followed the river north for over 2000 miles to the reach their final destination Chersky on Ambarchik Bay, by the East Siberia Sea. The two men followed the river north through what is some of the most inhospitable terrain on Earth. The temperatures plummeted to as low as minus 140 degrees Fahrenheit. It is here that the lowest temperature has ever been recorded on Earth – minus 98.7 degrees Celsius. At these temperatures mercury freezes solid. It is so cold trees explode and blue sparks fly from falling timber. When someone exhales their breath is transformed into a shower of ice crystals, followed by a tinkling sound referred to as “the whispers of the stars”. Adding to the acute dangers presented by the cold and wild animals was the fact that for nearly three months the explorers journeyed in total darkness with only occasional moonlight providing comfort. The conditions in this, the notorious Kolyma ‘Wild West’ region of Siberia, are so hostile that Stalin chose the area for his Gulags. Mikael Strandberg said “I am elated that Johan and I have achieved – and survived - what has certainly been my most challenging expedition to date”. “We have managed to film and document a huge amount of information on the native people and their way of life in a region where not even the Russians themselves have built up a comprehensive picture”. Mikael Strandberg’s journeys have all been remarkable feats of distance and endurance. He has literally cycled the world clocking up 90,000 km:- 27,500km from Chile to Alaska in 1986/7; 33,000km from Norway to South Africa in 1989 and 29,500km from New Zealand to Cairo in 1993/5. In addition to his cycling feats Strandberg has travelled 3000km through Patagonia on horseback in 1996/7 and spent a year with the Maasai documenting tribal life in 2000. Mikael is the author of six books, has made two documentaries and featured in two. He has undertaken hundreds of speaking engagements in Sweden and abroad. His Excellency Ambassador of Sweden to the Russian Federation, Mr. Johan Molander, sent a message of congratulations to Mikael. Congratulations were also sent from Barry Moss, Chairman of the Explorers Club British Chapter, Richard Wiese, President of the Explorers Club in New York and Shane Winser of the Royal Geographical Society’s Expedition Advisory Centre in London. Press conferences will be held in Moscow, Stockholm and in London on 18 May, 11am, at the Foreign Press Association, Carlton House Terrace, London SW1.